Owing to the wide experience of this domain, we are instrumental in offering Office ID Card to our clients. 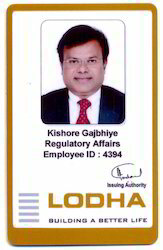 Backed by our prosperous industry acquaintance, we present Office ID Cards. We are offering Employee ID Cards to our customer at a reasonable price. We are offering Employee ID Card to our clients.